The Department of Social Welfare and Development admitted burying 284 sacks of rotten rice in a hole in Barangay Macaalang, Dagami, Leyte. DSWD Region-8 information officer Vina Aquino told InterAksyon.com that the spoiled rice, which was part of a 4,000-sack shipment from Cebu intended for victims of Typhoon Ruby, was supposed to be distributed through the food-for-work scheme in Samar provinces. Since the DSWD distributed the previous batch of rice first, the rice that arrived in third week of December last year was stocked in a warehouse. The new rice stocks may have gotten wet during hauling and handling, Aquino explained. The stocked rice began to stink in March and were found to be unfit for human consumption in June, she admitted. The DSWD failed to dispose the rice because, according to her, sorting it out involves so much work. DSWD's burying of rotten rice was discovered after a concerned citizen reported the activity to the Dagami Police Station at around 12:30 p.m. on November 27. Cops immediately proceeded to the area and found an excavated hole near the municipal water district's reservoir. In a Facebook post, the station disclosed that the rectangular hole measured 10 feet wide, 15 feet in length, and 8 feet deep. 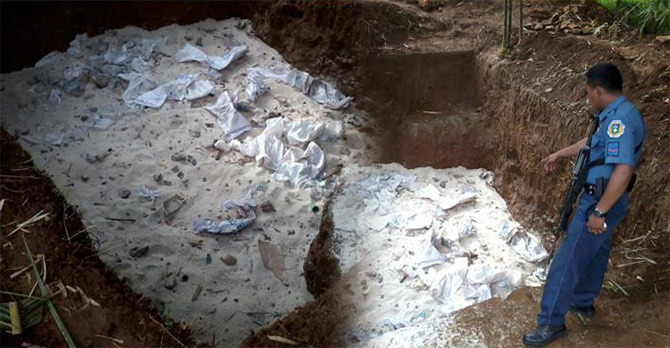 Dumped on it are rotten rice, the sacks and packaging of which were marked "NFA RICE" and "DSWD."